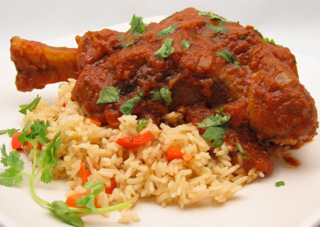 A ripe, fruit forward red with soft tannins would be the perfect match to this Indian spiced braised lamb dish. Try Tilia Malbec 2010 from Argentina’s Mendoza region. The wine displays concentrated black raspberry flavours and a touch of sweet spice. In a skillet over medium heat, toast the cumin and coriander seeds until fragrant, about 2 to 3 minutes. Grind in a spice grinder or crush using a mortar and pestle. In a large heavy oven proof casserole or Dutch oven, heat the vegetable oil over medium heat. Brown the lamb shanks in batches, making sure to brown all sides, then removing to a plate. Turn the heat to medium low and add the chopped onion and saute until very soft, about 8 minutes. Add the garlic and ginger, saute another minute. Follow with the crushed coriander and cumin, saute another 30 seconds. Add the turmeric, beef stock, crushed tomatoes, cinnamon stick, cardamom pods and chili flakes. Bring the mixture to a boil, stirring to scrape up and brown bits from the bottom of the pot. Return the shanks to the pot, make sure they are submerged in the braising liquid. Cover with a tight fitting lid and bake in the oven for 2 to 2 ½ hours. Halfway through, turn the lamb shanks. After 2 ½ hours, the lamb should be fork tender and the sauce thickened. Remove the shanks to a plate and keep warm. Remove the cinnamon stick and cardamom pods from the sauce. Season the sauce with ¼ tsp salt (or to taste) and add 2 tbsp honey and 2 tbsp fresh chopped cilantro. Serve with Basmati Rice Pilaf and yogurt. Heat the butter in a pot over medium heat. Add the onions and saute for 3 to 5 minutes, or until softened and starting to brown on the edges. Add the diced carrot and red pepper and saute another 2 minutes. Add the cumin seeds, cinnamon, cloves and cardamom pod. Saute 1 minute until fragrant. Add the rice and water. Bring to a boil over high heat, boil 2 minutes. Cover with a tight fitting lid and reduce to low heat. Allow to simmer over low for 10 minutes. Remove lid and fluff the rice with a fork. Remove the whole spices and season with salt to taste.